Spend360 provides clients with highly accurate spend visibility in a secure environment and procurement data categorized to their own taxonomy. Our artificial intelligence solution & a dedicated quality team, allows users fast access to your global spend from their desktop, offering easy adoption, fixed costs and without your own IT. A track record of success e.g Nike, BAE and HSBC. Many more references available. Secure environment audited by our customers - no data sent to 3rd parties. Cost Effective –productivity delivered at highly competitive fixed cost. Your Taxonomy not generic - measured against the client’s own taxonomy not a generic industry standard. Additional Enrichment Services – with the likes of D&B & Lexis Nexis allows enrichment services to maximize your data benefit. We price on volume of data itself rather than $ amount. Change Management is built in to our refresh costs. Tiered pricing – efficiency means lower cost. Savings identified in FM & Marketing > 5% in Y1 = $millions. Identified £20m of unmanaged spend & reduced cost by over 40% through sourcing management. Identified €millions of un-managed sales and marketing spend. Reduced by more than 50% through approved supplier sourcing. Improved service levels on reporting compliance from 3 mth to 1 mth. Increased spend visibility > 95% across £multi-billions of spend. Retailer – probably the best-known logo in the world. 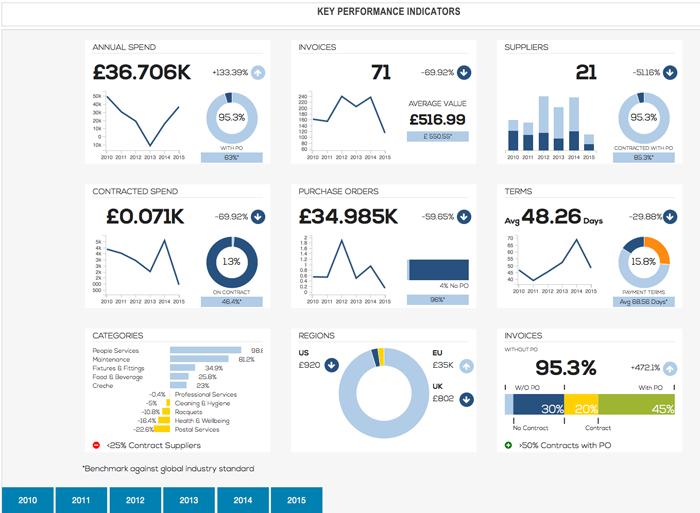 Ready to use dashboards and business intelligence data. This post is part of our 2016 Year-End Procurement Tech Review series, in which we offer procurement practitioners a bird’s-eye view of some key vendors and their solutions in select categories. This week, we’re highlighting companies in the risk management and spend analytics spaces. Although Spend360 is a relatively new entrant to the spend analytics solution space in North America, the company is well established in Europe. The firm commenced operations in 2011, and its founders have worked at previous start-ups in the sector. The founding team’s experience is apparent in Spend360’s spend analytics technology, as well as its ability to commercialize its capabilities. Beyond simply enabling the visualization of spending and related supply data, Spend360’s solution sets itself apart from the competition with its emphasis on classification through machine learning. Judging by its customer count and its references, Spend360 has quietly emerged as the spend analysis classification vendor to beat. While it has only begun to invest in marketing and brand awareness, it has quietly, both directly and through channel relationships, built a marquee list of accounts. On many levels, Spend360 has replaced Spend Radar as the most frequent independent competitor in the market, which before its acquisition by SciQuest, had also grown rapidly through partnerships and direct sales. Spend360 is a strong potential threat to not only procurement suite and ERP providers but also to independent solution providers like Rosslyn Analytics. As Spend360 expands in North America, it will be interesting to see how it competes against other fast-growing providers like SpendHQ, as well as other advanced technology firms like Tamr. That is, if it lasts independently for long — independent, fast-growing spend analytics companies have a long history of being acquired. For a more comprehensive analysis and guide for procurement organizations looking to understand whether they should consider adding the provider to their shortlists for consideration, please head over to the Spend Matters Almanac.